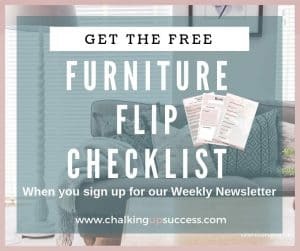 How to paint & stencil furniture with chalk paint - Chalking Up Success! 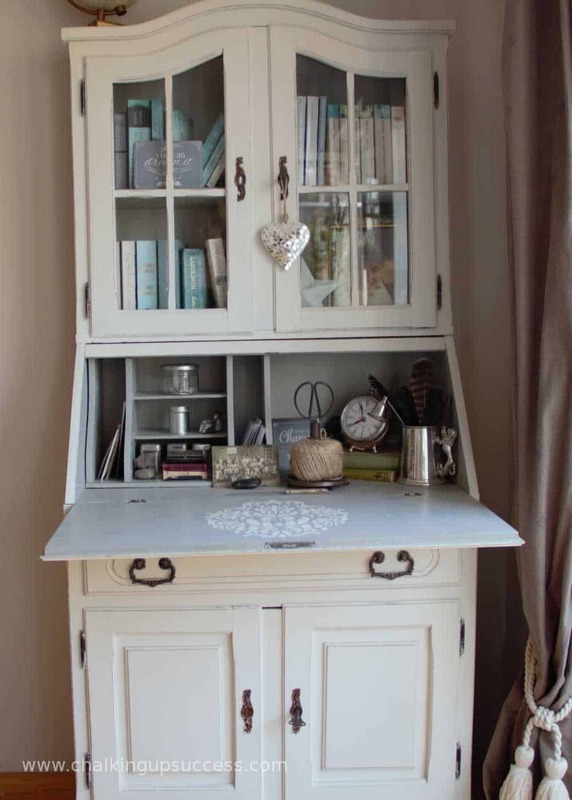 This lovely secretary makes the most gorgeous storage and desk space in our dining room. I’d been wanting to try my hand at stencilling with chalk paint for the longest time and just hadn’t found the right piece of furniture. I came across this old secretary on eBay one day and knew it would be perfect for what I had in mind. When I got the secretary home, it was a bit dusty from being stored for months in a basement. Other than that though, it was in perfect condition. 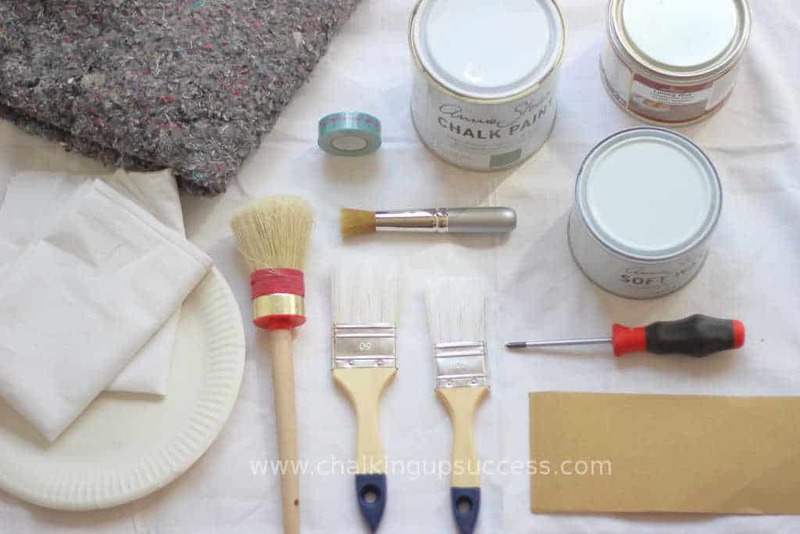 Here’s how I stencil furniture with chalk paint. 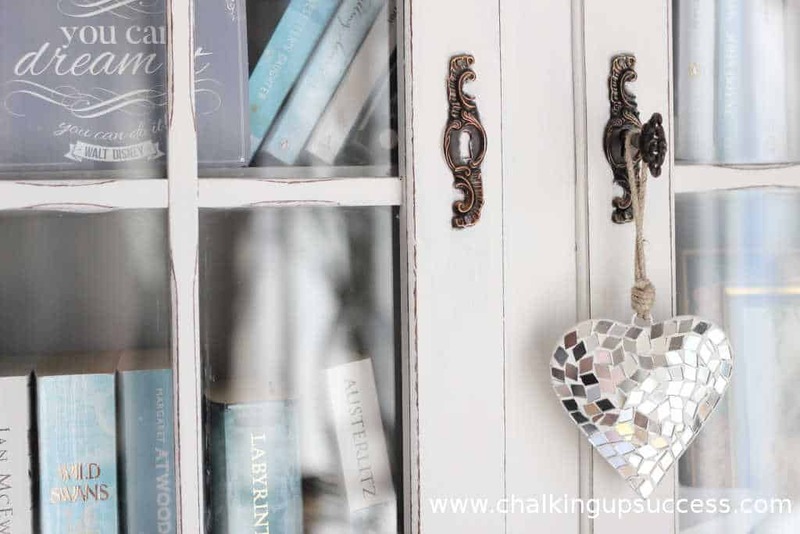 Chalk paint in the make and colour of your choice (I used Annie Sloan ‘Old White’ and ‘Paris Grey) You can see the full range of colours available here. Drop cloths – if painting inside: TIP: Put some newspaper or cardboard underneath the furniture so that you can paint around the bottom without your brush coming into contact with the drop cloth and getting bits of lint or fluff on your brush. Round brush for applying the Wax – Like these. You can also use a lint-free cloth if you don’t want to get a brush for this. New Hardware – if required you can find some gorgeous drawer pulls here. Stencil of your choice – I bought mine here. Stencil brush – Like these. The first thing to do as always is to clean out your furniture and give it a good wash down. 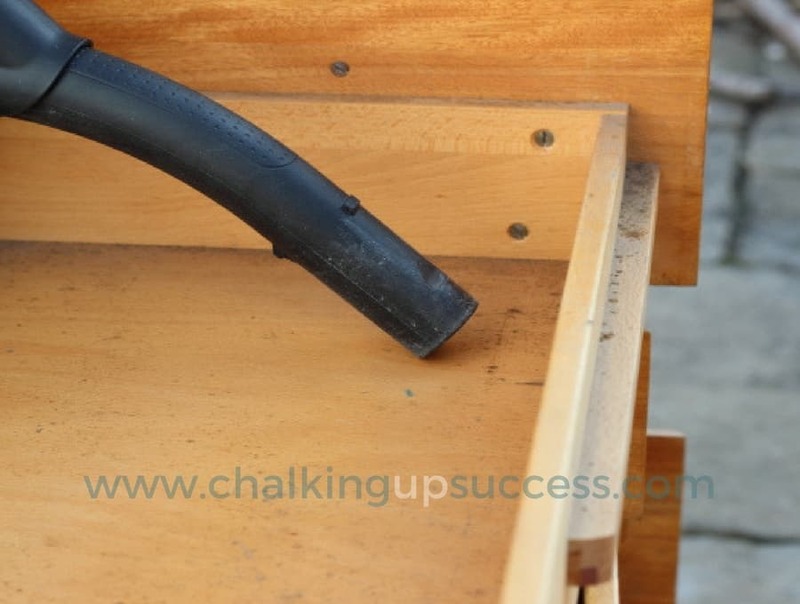 Go over it with a vacuum cleaner first to get rid of any dust that has accumulated in the drawers and cupboards. Then use some soapy water to clean it, making sure to wring the rag out well so that the wood doesn’t get too wet. Sometimes this type of wood will warp if it gets too much moisture so you obviously want to avoid that happening. 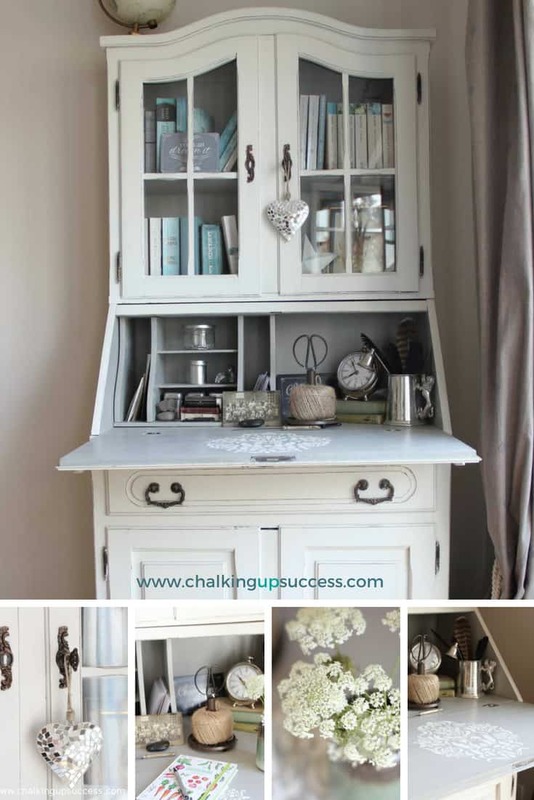 See my bookcase post for more info on cleaning furniture. After your furniture has had a little time to dry, the first job will be to remove the hardware ready for painting. Make sure you keep all the hardware and screws together in a plastic bag so that you know where everything is and nothing gets lost. 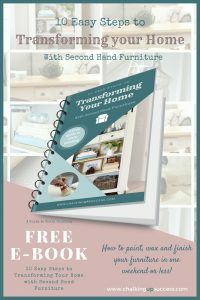 I quite often change out the old hardware for an easy up-date option and if this is also your plan, take a look at this lovely hardware selection. 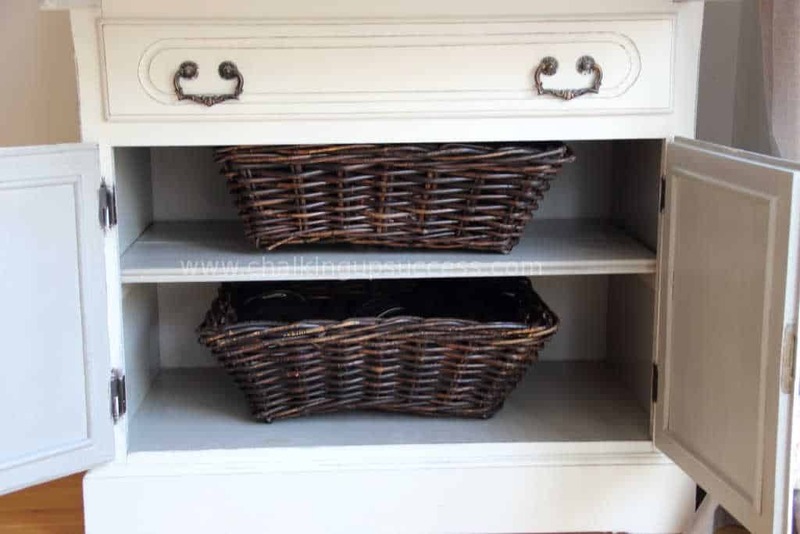 Take out the drawers and shelves so that you can paint those separately. Always test out the paint on the wood first, because even though Annie Sloan Chalk Paint covers really well, sometimes you get bleed through of the old paint stain. I find this mostly happens with the darker stains. To test for bleed through all you have to do is to paint a small section of the furniture with paint and wait for it to dry. If you see the darker stain showing through from underneath, you will need to use an isolating water based primer first. The original stain on my secretary was a light wood colour and there was no bleed through so I didn’t need to use a primer this time. If you find you need to use a primer, take a look at my post Easy Bookcase Makeover – Part Two where I go over how to apply it. The first thing you need to decide is which colours to use. When you stencil furniture with chalk paint, you really want the stencilled part to stand out. 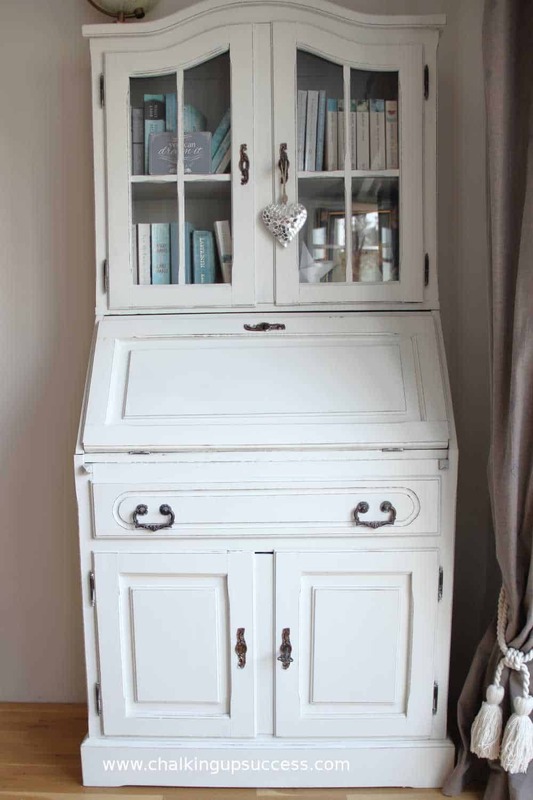 Most of the furniture I’ve painted for my own home has been painted in Annie Sloan ‘Old White’ or ‘Paris Grey’ Chalk Paint. 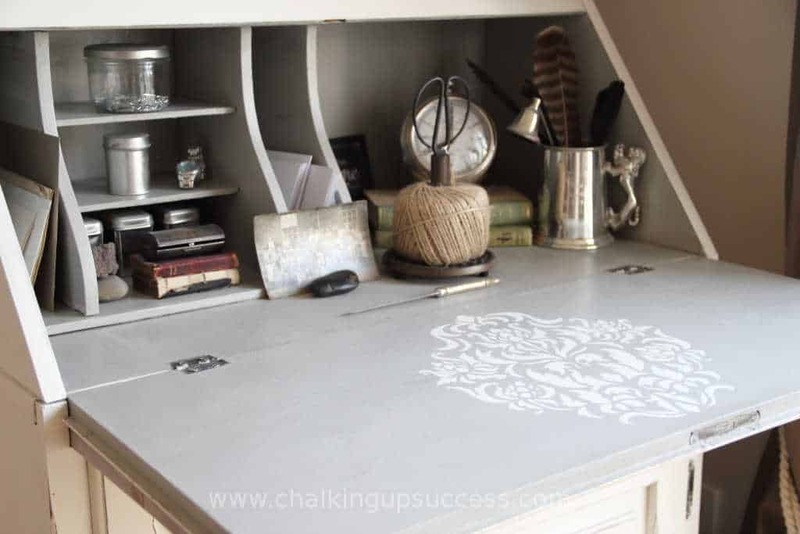 This time I decided to combine the two and make my stencil stand out by using Paris Grey on the inside of the secretary desk and using Old White for the stencil. I’m not going to go over how I painted the rest of the secretary since I’ve covered that really well in previous posts like Riviera Maison Inspired Coffee Table Makeover and Easy Bookcase Makeover – Part three so if you’re starting from scratch, I recommend you read those posts before you start. So you’ve painted your furniture in your colour of choice and have picked out a contrasting colour to use with your stencil. By the way, if you’re looking for stencils, you’ll find a great selection on Etsy here (for general stencils), or here (for Damask Stencils) which is where I got mine. I’m sorry, I don’t remember the exact shop but there are so many gorgeous stencils on Etsy you’re bound to find something you like. I also don’t like to recommend a specific shop because it depends on where you live as to which Etsy shop you use. For instance, if you’re in the USA you don’t need to be buying a stencil from a shop in Europe or vice versa (think carbon footprint!) The next step then will be applying your stencil. Once you’ve decided where you want your stencil to be, use some masking tape to tape it in place. This will make sure that the stencil stays put while you’re painting and won’t smudge your paint. I’ve only ever used a stencil brush to stencil furniture with chalk paint so I can’t tell you if it will work as well with any old paintbrush. Stencil brushes are quite thick and the bristles are cut flat which makes them great for stippling the paint onto the stencil. Again, Etsy has a great choice of stencil brushes which you can see here. 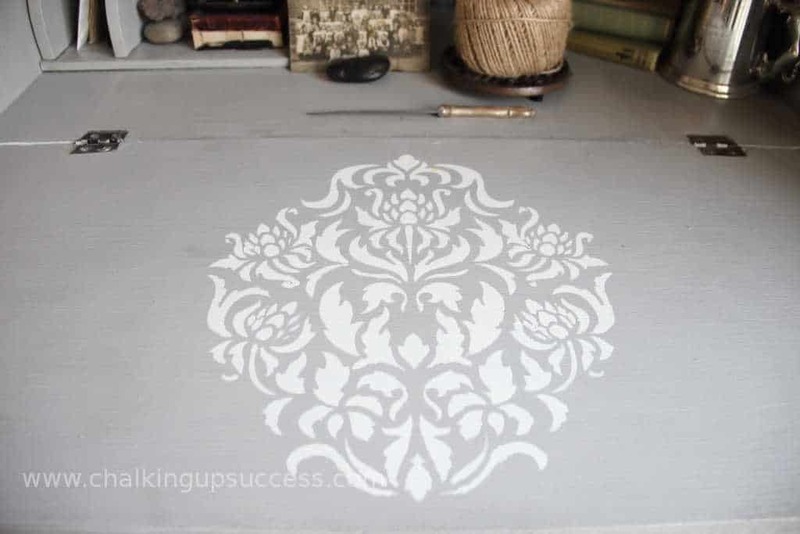 For smaller stencils like the one I used, you only need to use a small brush. Take a large spoonful of paint out of the tin and place it into a container (I use an old cup for this). 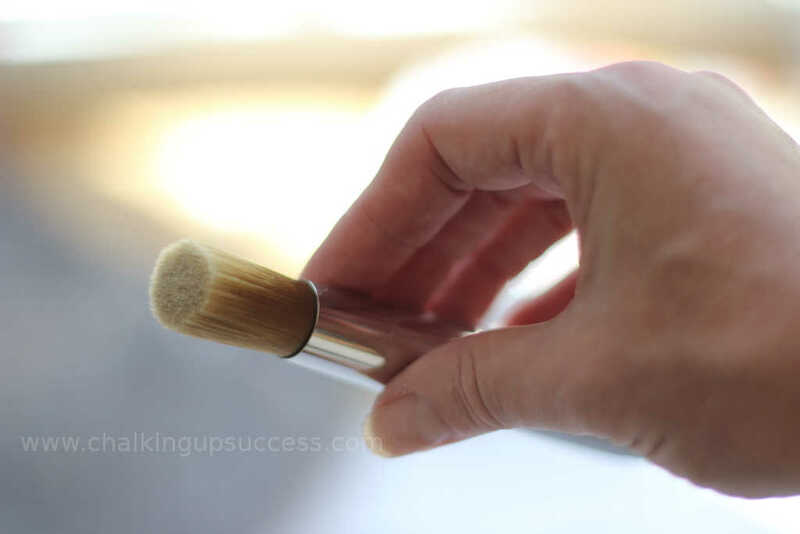 Gently dip the tip of your stencilling brush into the paint. You don’t want too much on there and you can wipe some off on a paper plate if you think it’s too much. If you load your brush too full and use it straight on your stencil, it will bleed through and wreck the whole design. It’s always better to add more than to overload your brush with paint. Now take the brush and using a stippling technique (dabbing not brushing) gently dab the paint onto the stencil. 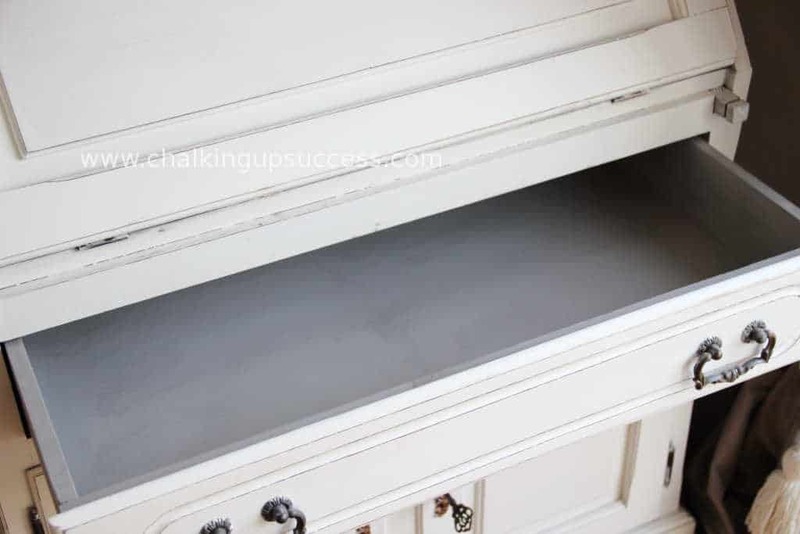 The great thing about stencilling with Chalk Paint is that it drys really quickly so if you need to, you can paint a second coat almost immediately. Once you’ve finished, remove the masking tape and gently peel back the stencil and admire your handy work – yay! Normally, I finish my furniture with a couple of layers of clear wax but because this desk surface gets tonnes of use, I gave it two coats of water based poly to seal it. Poly is easy to apply with a brush or a roller and will protect your surface from spills. One thing to look out for is that it states on the tin that the poly is non-yellowing because some will turn a yellow colour after a while or if the furniture is in a place which receives a lot of sun like next to a window. I don’t sit and work at this secretary because my computer is in my tiny little office, but I love to sit here to fill out my planner in the evenings and check off what I need to do for the next day. 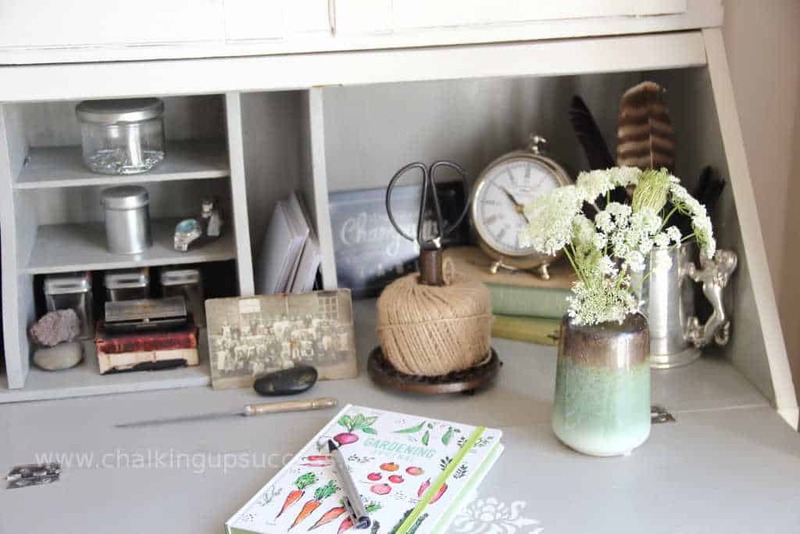 There’s usually a vase full of wildflowers and grasses from the meadow on the desk and I also love to display various seasonal finds here like shells, feathers, pebbles and other ‘treasures’ which I find inspirational. I have a great view of the garden from here so I often sit and plan any changes I’m going to make and jot down my thoughts in my lovely garden planner which was a gift from my friend Helen over at ‘Leaves From My Garden’ – UK’. So there you have it! 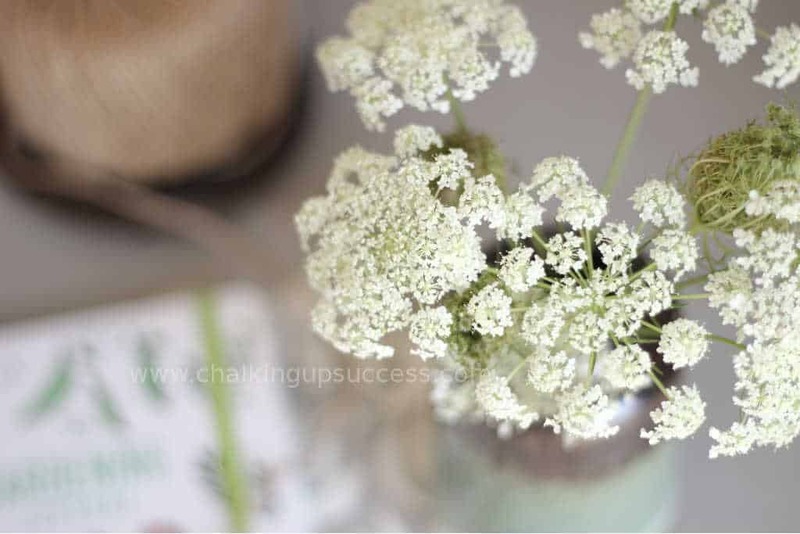 I hope this post has inspired you to have a go at stencilling with chalk paint and I’d just love to see what you create. I recently discovered chalk paint and now I want to paint just about everything in my house! 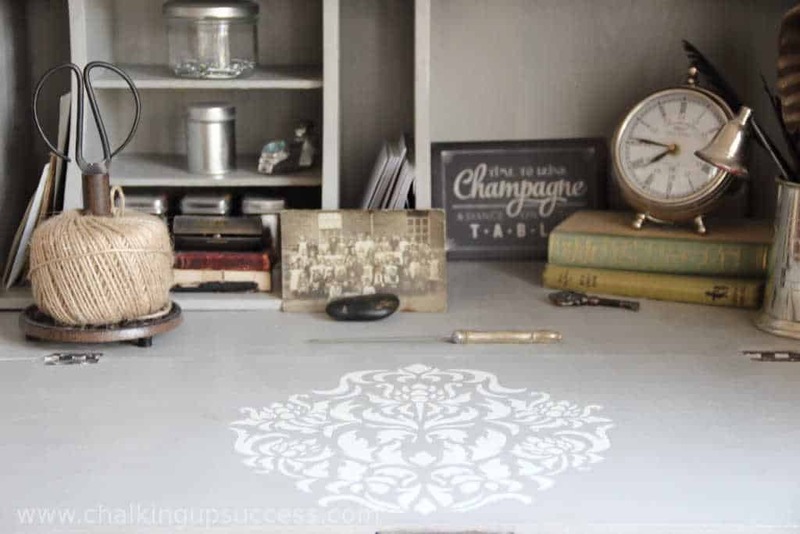 I love the idea of stenciling. It can really make your pieces stand out. Yes, I think chalk paint is a little addictive!